TACLOBAN CITY- Controversial Chief Inspector Jovie Espenido was a no-show during the preliminary conference on the charges filed against him by Ormoc City Mayor Richard Gomez at the regional office of the National Police Commission (NAPOLCOM) on Thursday(January 11). With his failure to attend the preliminary hearing, the lawyers of Gomez submitted their motion citing Espenido to have waived his right to answer the complaint filed against him which was granted by the three-member ad hoc committee of the NAPOLCOM. 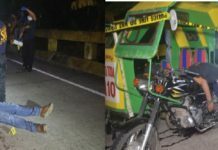 Espenido, who was then the police chief of Albuera, Leyte, was accused by Gomez of grave misconduct, grave abuse of authority, dishonesty and conduct unbecoming of a police officer. Gomez originally filed his complaint against Espenido and two others before the national NAPOLCOM office on November 16, 2016. Also included in his complaint were PO3 Hydie Yutrago and Chief Inspector Leo Laraga who both appeared together with their respective lawyers. 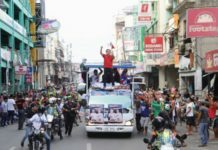 Gomez said that he is determined to have Espenido, in particular, be held liable and remove him from the police organization for maliciously maligning his name and reputation, both as a mayor and an actor. “We were tagged as drug capital of Eastern Visayas so when I became mayor, I worked hard to make Ormoc City as drug-cleared to show that I hate illegal drugs. And for me to be accused (of engaging in the illegal drug trade), talagang kakasuhan ko sila,” Gomez said. The complaint filed by Gomez against Espenido, who is now the police chief of Ozamiz City, stemmed from his reported act releasing four prisoners who were held at the Ormoc City Police on October 17,2016. The four, Marcelo Adorco, Jose Antipoesto, Jessie Ocares and Jernie Estrera were said to be henchmen of drug lord Kerwin Espinosa, himself detained at the Camp Crame custodial facility. According to Gomez, the release of the four through the intercession of Espenido posed a threat to the security of the people of Ormoc. The whereabouts of the four remain unknown up to this time. Gomez filed a complaint against Laraga for publicly tagging him using Espenido as his source as among those involved in the illegal drug trade during his appearance during a Senate investigation on November 10,2016 while Yutrago was allegedly responsible in forcing Max Miro, Gado Stephen Bobares, and Brian Anthony Gates Zaldivar, all said to be trusted men of Espinosa, signed a ‘ready-made affidavit’ listing down names said to be in the illegal drug trade. Lawyer Haidee Borja, a member of the panel, said that during the preliminary hearing which lasted close to two hours, lawyers of Gomez submitted their position papers with their documentary evidences attached on them. They are to submit their report within 15 days and will submit it to their commission en banc which will render its decision. “Despite our due notice, respondent Chief Inspector Espenido did not appear, (so) we granted the motion of the prosecution to have waived his right to appear and file his position paper,” Borja said.